Just imagine! A part-time career in massage that is ideal for stay-at-home moms! If you’re like most of our graduates, you’re someone with a generous spirit and a compassionate nature. You value your personal wellness and you strive to live a healthy lifestyle. You love massage – both giving and receiving and you know how powerful it can be help people feel grounded and relaxed. You’re now at a place in your life where you’re looking to start a new career – one that allows you to feel good about yourself and feel like you’re making a real difference in other’s lives. You have always been drawn to a career in wellness and now’s your time! YOU want a wellness career that meets your needs! YOU are a people person! YOU can have all this and more as a Certified Chair Massage Provider! … and the best part is that the training to become a Certified Massage Provider is fast and affordable! YOU can be trained, equipped, and ready to work in less than 30 days for as little as $895! Chair Massage is the fastest, most cost-effective way to enter the field of massage. You’ll achieve a certification that is recognized throughout Canada and the United States, enabling you to work anywhere you like. The training process is quick and flexible. You can complete the entire certification training process online, or you can attend our in-class training over 6 days. You can easily complete the entire certification process in 30 days! Chair Massage is the best way to be visible in your community and attract the people who will become your loyal clients. You can make a great income. Those who choose work for themselves and develop their own work opportunities can look forward to making upwards of $60/hour. Those who would prefer to work for companies that hire Chair Massage Providers can expect to make $25 to $30/hour. The training and equipment is affordable. You can be fully-equipped, trained and ready to start making a great income for as little as $895. We’ve been training Chair Massage Providers for over 15 Years. Our programs will provide YOU with the skills and confidence to perform various chair massage routines your clients will love. As well, we’ll guide you step by step to build your ideal chair massage practice. Train in the comfort of your own home, on your own schedule! This is our complete chair massage certification program delivered via your computer! Everything you need for chair massage success! Chair massage is a relaxation massage performed on a portable massage chair with the client fully clothed. There are many benefits of chair massage, including but not limited to, stress reduction, improved circulation, relief from chronic pain, enhanced relaxation and sleep. How is chair massage different for seniors? Chair massage for seniors is customized to their unique needs and preferences. Massage is particularly helpful to increase circulation and mobility for senior clients. Additionally, it is ideal for clients that are challenged with chronic pain, stress, and a sense of isolation. How long will it take to become a Chair Massage Provider? On average, most students (even those working full time) are able to complete all their requirements for certification within 30 days. Classroom Phase – For the Short & Sweet Chair Massage Course, you’ll be in class on Friday evening, 7:00 – 9:00 pm and then Saturday & Sunday, 9:00 am to 5:00 pm each day. For the full chair massage training program, you will be in class from Monday to Saturday, 9:00 am to 3:00 pm each day. Skills Development Phase – You will complete 20 documented massages and the 20th massage is videotaped by the student and sent to their instructor for assessment. Which Organizations Recognize Our Chair Massage Training Courses? We are pleased to be registered with PTIB – Private Training Institutions Branch – http://www.privatetraininginstitutions.gov.bc.ca. Our programs are also registered with ESDC – Employment and Social Development Canada. This enables us to provide Federal Tuition T2202A Tax Receipts to our students. We are an Approved CE Provider with the NCBTMB – National Certification Board of Therapeutic Massage & Bodywork – www.ncbtmb.org – and our Quick Start Chair Massage Course qualifies students for 12 CE credits. What if I don’t complete my Skills Development massages within two months? If you have not completed your skill development phase within two months, you will be required to apply for a re-assessment for $100. The only exception is official medical notice, in writing. A certificate of course completion will be issued when Integra College receives your completed skill development forms and full payment of tuition fees. How difficult is the Online Academic Training Module? The Online Academic Training Module was designed based on our students having no previous background in anatomy and physiology. The module helps to build a base of knowledge prior to the Classroom Phase. Having an introductory exposure to the structure and systems of the body will help make your massage more effective; and will give you a greater appreciation for the profound effect massage can have for clients. Each section is followed by a multiple choice quiz and you will need to achieve a passing mark of 70%. If you don’t achieve at least 70% the first time, you can review the section and re-take the quiz. Do I need to be young and athletic to perform chair massage effectively? We have had students from 18 to 75 do very well performing chair massage. The key is proper body positioning and bio-mechanics. We teach and emphasize correct body posture throughout the massage routines. We also teach effective techniques for taking care of your body in between and after massage sessions. When I become certified, what employment opportunities do I have? A chair massage practitioner has a lot of career flexibility. After you have completed the program and have your liability insurance in place you can start working immediately. 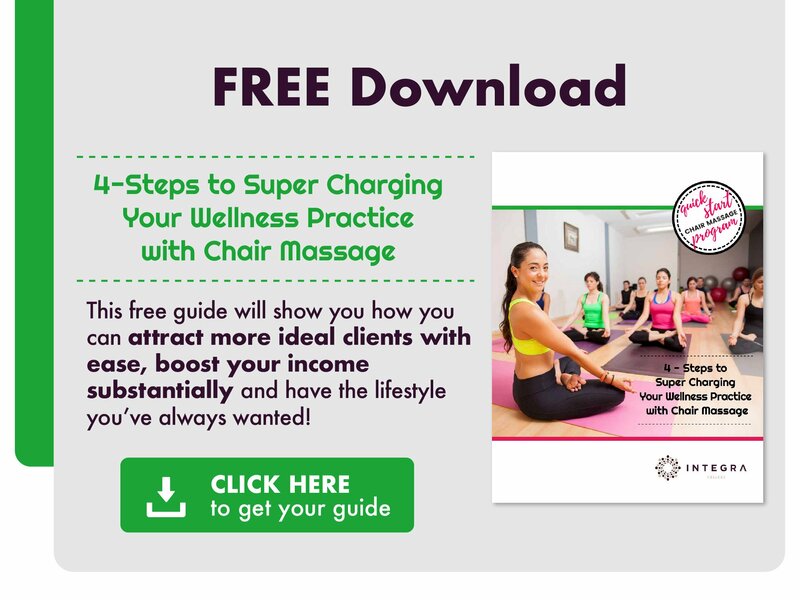 You can choose to focus specifically on providing chair massage in seniors’ communities, the workplace, festivals, shopping malls, or while travelling and so on. If you like the idea of working with other chair massage providers, you can join our Integra Chair Massage Event Team and participate in festivals, sports events, farmer’s markets, trade shows and conferences as part of a team! Chair massage is more than just a great way to enter into a career in health and wellness. It’s also a great way to make a healthy living. Because of the flexible nature of the profession, how much you make depends on whether you choose to work for yourself or someone else. The standard rate for a 15 minute chair massage is $20 and a chair massage provider can comfortably perform 3 – fifteen minute sessions per hour and 4 hours per day. If you work for yourself you can potentially make $60 per hour and if you work for someone else, $25 to $30 per hour. Most Chair Massage Providers choose to work 1 to 3 days per week. 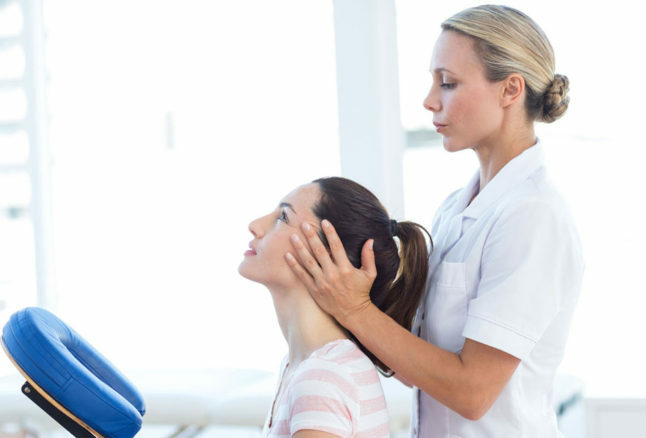 Why a Career in Chair Massage? Chair massage opens many doors. It is the most time and cost-efficient way to get started in massage and bodywork. It easily leads into a variety of health and wellness modalities, such as Reflexology, Aromatherapy, Shiatsu, Jin-Shin Do, Hot Stone Massage, Massage and Senior Wellness Practitioner, to list a few. What is the upcoming 2017 course schedule? What does the Chair Massage Course Cost? Please note: access to massage chairs are provided during the Classroom Phase of the course. Students will then need to make arrangements to purchase their own massage chair to begin the Skills Development Phase. 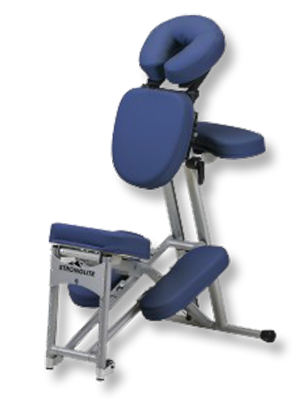 We recommend the Stronglite Ergo Pro II massage chair. Certified Chair Massage Provider? If so, click below to get started!